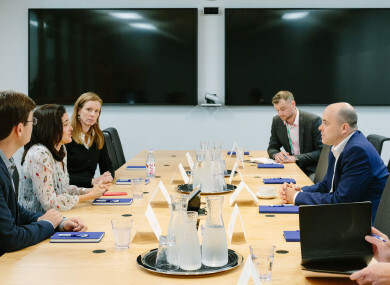 Minister Denis Naughten meeting Facebook's Sheryl Sandberg in California. FACEBOOK EXECUTIVES MADE a commitment to Communications Minister Denis Naughten that it will review their age verification policies on an ongoing basis. During a meeting with Facebook’s Chief Operating Officer Sheryl Sandberg in San Francisco, the minister raised the findings of this week’s CyberSafeIreland study which found that over half of nine year olds are on social media despite age restrictions. The survey also found that 32% of children are talking to strangers online every week. During the meeting, which took place at Facebook’s headquarters in California asked Sandberg to explain, in practical terms, how the age verification system operates on Facebook platforms. It is understood he impressed upon her the need for technological innovation in this area in order to protect against circumvention of age restrictions on Facebook’s platforms. Sandberg outlined Facebook’s policies and actions in addressing underage profiles which includes blocking accounts reported or suspected as being underage. Facebook executives committed to the minister that they would review their age verification policies on an ongoing basis and will update mechanisms where appropriate. The social media company, which has its European headquarters in Dublin, has come if for heavy criticism over the summer due to a number of failings. Appearing before an Oireachtas committee executives committed to make a number of improvements. Naughten also held talks with Google’s senior executives at Google’s Headquarters in California. The results of the CyberSafeIreland study was also highlighted to Google’s Trust and Safety Division. Google highlighted its Google Family Link Service to the minister which is a tool that parents can use to protect children from accessing age inappropriate content. The minister asked Google to develop this service further in order to strengthen the support for parents to ensure children do not access age inappropriate apps and content. Email “Minister raises age verification issues with Facebook's Sheryl Sandberg ”. Feedback on “Minister raises age verification issues with Facebook's Sheryl Sandberg ”.